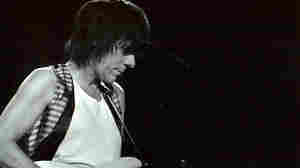 December 28, 2010  Last year was big for Jeff Beck: He sold out a world tour and was inducted into the Rock and Roll Hall of Fame. 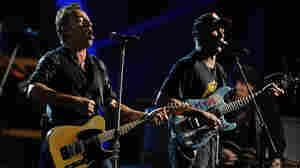 He followed this success with a return to the studio to record a mix of rock and classical covers. April 4, 2010  Jeff Beck's new album — available here in its entirety until its release on April 13 — is a collection of songs that suit his adventurous style, with some cushioned by a symphony orchestra and another featuring the young soul singer Joss Stone. December 27, 2001  Mitch Myers remembers a night in 1981 at a Jeff Beck concert. 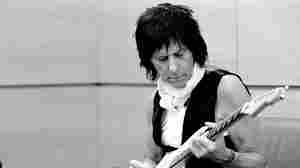 He had the idea to throw the a comb toward Jeff Beck. The comb lands on the stage and for the rest of the show Myers' friends watch with anticipation to see what the great guitarist would do. There are two pieces of music here: 'Cause We Ended as Lovers' from the album Blow by Blow and 'Freeway Jam' from the album Jeff Beck With The Jan Hammer Group Live. Both songs are also available on the collection called Beckology on Epic Records.